Abrupt changes in science and in engineering, not only in terms of the events but in terms of the methods dealing with them, seldom occur. There is normally a sufficiently long transitional period to convince or to admit what really happened, or,’how it happened. In statical systems, the dynamism is not in the system itself, but more profoundly, is in the understanding of one’s mind. Such an understanding in structural analysis has shifted from mathematical to graphical.toward the end of the last century and from scattered problem-oriented methods to general matrix methods after the middle of this century. Finally, the sixties, during which the matrix methods gained considerable popularity, have witnessed books and texts of a transitory nature mounting the matrix methods on the old concepts -in which the structures were already classified as statically determinate or indeterminate. As a result of this, many chapters in recent texts have been labeled as the analysis of determinate or indeterminate structures by matrices. Since the matrix – methods can hardly distinguish a determinate structure from an indeterminate one, such a classification, therefore, can hardly be justified. By considering the rapid changes in science and technology and in believing strongly that such a transitional period-from problem-oriented methods to most general matrix methods—is approaching its end, this text is designed to introduce the student to the concept of structural analysis without expecting him to possess any previous knowledge in structural analysis. The prerequisites of this text are, then, a fair, amount of knowledge in statics and in strength of materials. The fundamental principles—upon which structural analysis rests—are presented in Chapter 1, while the subsequent three chapters are devoted to matrices, simultaneous equations, and coordinate transformations. These introductory chapters provide the student with the necessary tools to be used in the analysis of structures. In order not to bury the student in the details of analysis for each type of. 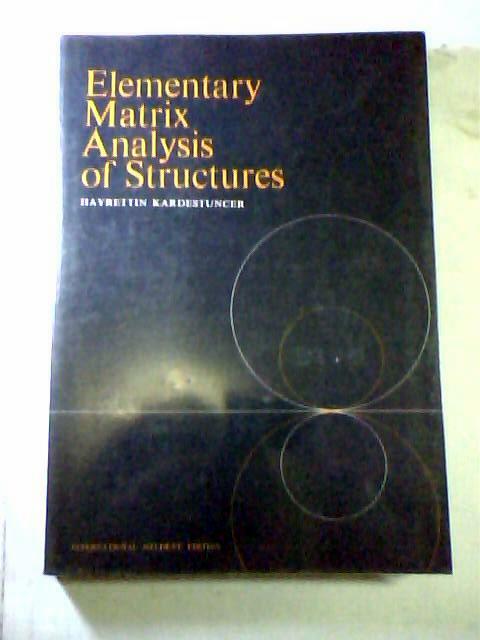 structure at the start, the stiffness matrix method (Chapter 5) is selected to introduce him to the analysis of structures in general. By the end of this chapter, the student should be able to analyse any structure, provided that the external loads, are applied on the nodal points, temperature is constant, the supports are unyielding, and the members are prismatic. In other words, the analyses of basic structures, regardless of their shapes and dimensions, are completed and the above-mentioned details which are also independent of the type of structures are taken care of individually in Chapters 6’to 9. The last two chapters, on the other hand, are intended to indicate that the structures can be treated and analyzed in other ways as well. Although the text is developed from my original lecture notes of a graduate course and from numerous lectures for practicing engineers, during the past few years I have modified them considerably and tested them extensively for undergraduate students. Computer programs, algorithms, and flow charts are not included in the text because of the experience that such programs become obsolete before the texts are printed, and the flow charts are expected to vary from one student to another, indicating his own way of handling the material. Since the students, as early as high school, are, exposed more and more to the most recent computers and languages, their education in computer technology is well taken care of. Consequently, in order not to deviate from the main objective of the text—matrix analysis of structures–communications with computers are excluded from the text. There are numerous fine texts suitable specifically to the language and the machine to which the student may have access. It is very difficult to serve both the students’ formal education and training equally in one text. Emphasis is often placed on one depending upon the nature of the topics covered in the text. How can one train students to these powerful techniques without sacrificing much from their education ? I was continuously tormented by this question while compiling this text. Regrettably, performance does not necessarily require understanding, yet neither the performance nor the understanding alone is sufficient. It now remains for me to express my gratitude to my former teachers: the late Prof. Mustafa Inan of Technical University of Istanbul, Prof. Charles, H. Norris of Massachusetts Institute of Technology, Prof. Rene de Possel of Institut Blaise Pascal, Prof. Raymond Siestrunck of the Sorbonne. I owe much to all of them. Finally, I am thankful to Gregory Cichowski for his generous help in proofreading.